MUNICH — Somewhere between the patent introspection of his new Mompou CD* and the tags of his early Stateside career — “big bravura pianist,” “new Horowitz” — lies an accurate description of Arcadi Volodos. It may simply be this: German Romantic, as in Schumann and Brahms, with impressionist flair. That was the take, anyway, from a commanding, technically flawless Bell’Arte recital Dec. 12 here at the Prinz-Regenten-Theater, and it is buoyed by the disc. The 41-year-old pianist from St Petersburg stands distant from the trajectory of his rise: 1998 Carnegie Hall debut, Berlin readings of Rachmaninoff and Tchaikovsky concertos (1999 and 2002). He still plays with strength and vision, but what distinguishes him now is a command of form and the willingness to disturb it in expressive ways. Stardom, meanwhile, has improbably blurred thanks to the presence of another St Petersburg pianist with what trademark authorities might term a confusingly similar name, Alexei Volodin, 36. (No also-ran, the latter gave a recital himself Dec. 15 at the Mariinsky.) Even so, allegiance to Volodos has held firm, particularly here in Germany, and to its credit his record label Sony Classical has stayed with him. Schubert’s 1815 C-Major Sonata opened the recital, stitched up with its Allegretto (D279/D346). It seemed a weak choice until Volodos testily hammered and carved his way through, knowing exactly what he wanted from the music. We heard the sound of Beethoven. 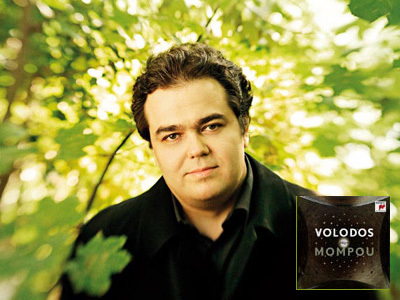 After the break and a fluent Schumann Kinderszenen, Volodos boldly energized the same composer’s C-Major Fantasie (both 1838), its three movements speaking with phenomenal power and passionate unity. For the Finale (Langsam getragen, durchweg leise zu halten), he coaxed a mood of poignant reflection unmatched even by Pollini in the famous 1973 recording (made across town here at the Herkulessaal). The CD* of miniatures by Federico Mompou (1893–1987), recorded last December in Berlin, is a worthy issue in these times of superfluity. Few distinguished recordings have been made of the Spaniard’s music, and Volodos commits himself intensely to it, judging from his liner essay as well as his playing. Although the output is often related to Satie, Mompou’s late imaginative world (not the style) lies closer to Debussy in his Préludes. Volodos declares the four Música callada sets (1951, 1962, 1965, 1967) to be peaks of achievement: “ … the music [Mompou] spent all his life moving towards … wrested from eternity, as if it already existed in the Spheres … .” He plays eleven of the pieces, from the total of 28, drawing on all four sets in a sequence his own. This “quietened music” is both abstract and personal, the product of an old solitary man, but not one at death’s door; Mompou lived another twenty years after completing Set 4. Many pieces are “Lento,” a marking that satisfies the composer for divergent exercises in peace (VI), pain and emptiness (XXI), and generalized remoteness or stillness. Others, such as the Moderato XXIV of 1967, flow so plainly and concisely that a marking is hardly needed. The many chilly passages in the Música callada tend to be broken by warm chords in unexpected places. Volodos revels in the myriad nuances of these valued miniatures and, as in Brahms, downplays contrasts in favor of coherence. He finds fantasy here and there, catches the fleeting moments of excitement, and instantly lets ideas go when they must. The interpretations are light of touch and magical. Half of the disc holds short independent works, most of them tellingly shaped. In Preludio 12 (1960) and elsewhere, Volodos shows Vlado Perlemuter’s knack for placing just the right weightings in pale adjacent phrases to support a long idea, saving music that could easily sound aimless. The much earlier (1918) Scènes d’enfants suite, home of the cute encore Jeunes filles au jardin, receives an imaginative traversal. Sony’s release is strikingly packaged with photographic details of Antonio Gaudí buildings in Barcelona, the composer’s home town, although typos mar its booklet. The company might now want to entice Volodos into documenting the remaining Música callada. This entry was posted on Sunday, December 22nd, 2013 at 10:20 am	and is filed under Munich Times. You can follow any responses to this entry through the RSS 2.0 feed. Both comments and pings are currently closed.